Data center, IT, and general consumer server environments have a broad range of requirements - from basic connectivity to extreme data storage capacities. The effectiveness at which their data is accessed and protected is crucial to their ultimate success.. 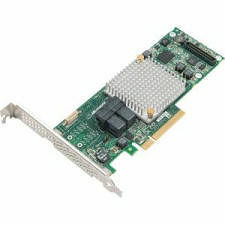 The Adaptec Series 8 12Gb/s RAID Adapter product family directly addresses the connectivity, performance, and data protection needs, unmatched by anything in the industry. The Adaptec Series 8 RAID adapter family features PMC's PM8063 RAID-on-Chip (ROC), which combines a x8 PCIe Gen3 interface with 12Gb/s SAS ports to enable a new generation of high- performance RAID adapters for the 12Gb/s storage ecosystem. Adaptec Series 8 RAID adapters are available with 8, or 16 native SAS/SATA ports in an LP/MD2 form factor. The mini SAS HD connectors combined with SAS HD cables allow for greater flexibility in configuration options by supporting up to 16 native SAS/SATA ports in a Low-Profile MD2 form factor.